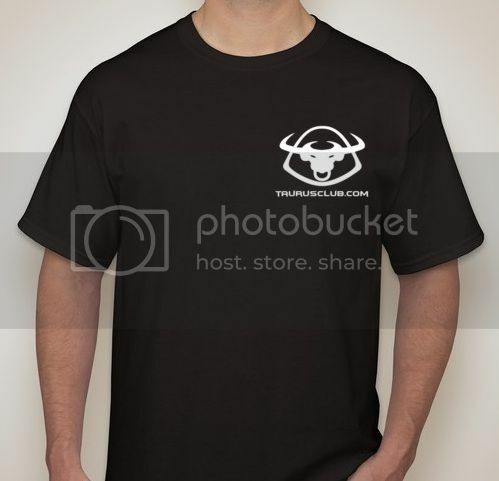 Taurus Car Club of America : Ford Taurus Forum > Official Business > Merchandise > 2015 SHIRT DESIGN! View Poll Results: Which Logo Do You Like Best? 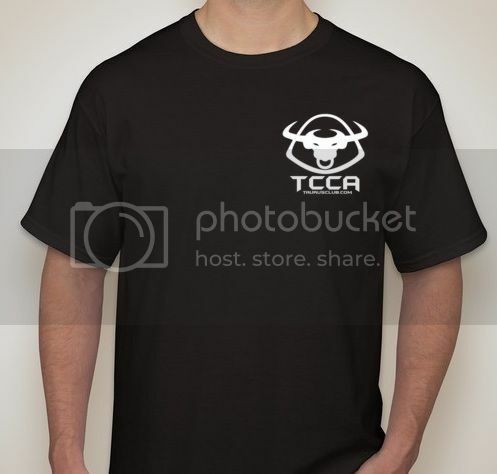 Hey everyone...... as in this thread here, https://www.taurusclub.com/forum/77-m...n-up-here.html, we are going to be doing another group buy for TCCA T shirts. In order to keep the cost down to entice more people in buying them, it will be a smaller front logo on the left breast. It will be a black shirt with a white logo. Here's where YOU come in! We have narrowed it down to 2 designs, however we figured that you should have a say in which one. So please vote in the poll on which one you would rather have. The majority rules so the winning logo will be what we are going to use for the shirts! Just so everyone sees as well these are what the logos look like.. I think the bull should have red eyes! I know, it probably costs too much to have a second color. Would I have permission to take this to my local screen printing shop to make this a rear window decal? Will be going on my personal vehicle. Good idea but I think the bull should have blue eyes! Blue or Red eyes.... I see white logo are the shorts going to be Black or Blue like last year? My vote is option #2 with the Blue shirt/white logo. Shirts will be exactly as posted in the first post. Black shirt, white logo. Changing colors makes things more expensive and we are trying to keep the cost low to get a good order together. The more we buy the cheaper they get. I don't see an issue with it, so long as it's for you. The logo is property of Autoguide and we have specific permission to use it for the T-Shirts so long as it's not for profit. As long as it isn't sold for-profit. I like the second design. I want one!